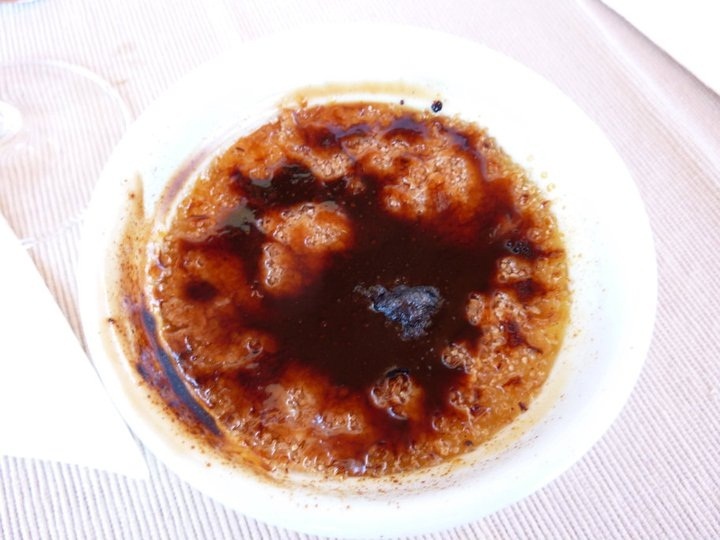 So the final course in our three course adventure for our parents was to tackle a creme brulee. Back in December, Santa Claus had known his audience well and a kitchen blow torch and a can of butane found its way into my stocking. So excited!! And I’ve been hanging out for an opportunity to use it since then! 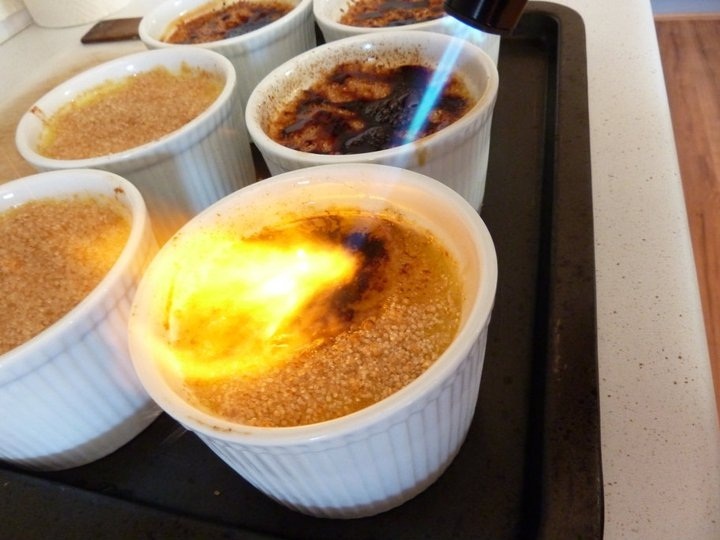 My cooking club, back at our french gathering, tackled the creme brulee, with mixed results…. second round worked slightly better, but still a work in progress. So this time I used a slightly different recipe from the Donna Hay Seasons Cookbook. What a stunning collection of recipes – so beautiful with all the lovely photos she has taken. 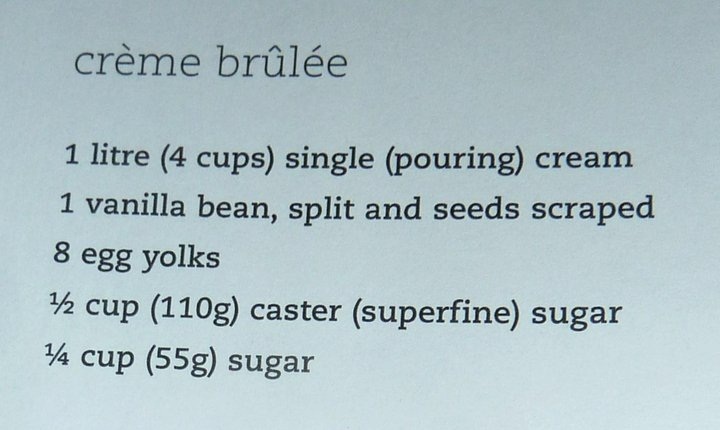 So to the Winter dessert section and here were the key ingredients for the creme brulees…. 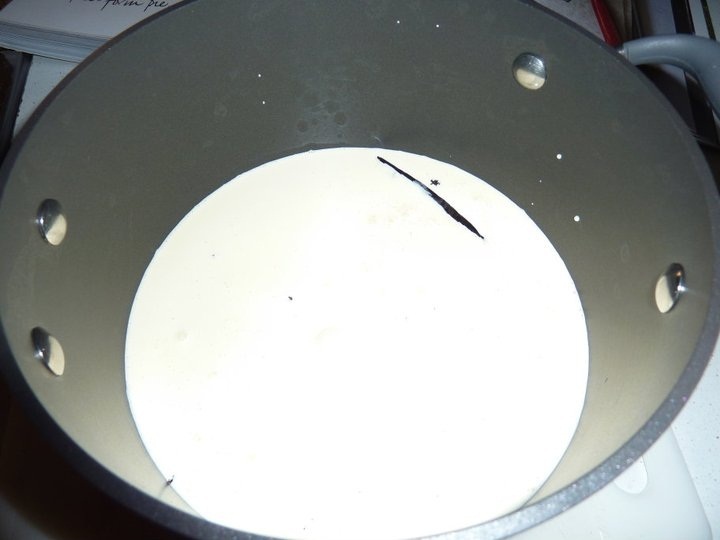 So the first step was to split the precious vanilla bean and put that into a sauce pan with the cream and to simmer for about 3 minutes on really low heat. Once that’s been done you set the pot aside for another 20 minutes so that the vanilla flavour has a chance to infuse through. You then add in the half a cup of caster sugar and the egg yolks and again over low heat for 7 to 8 minutes keep stirring it. As I found out, low heat is absolutely key! 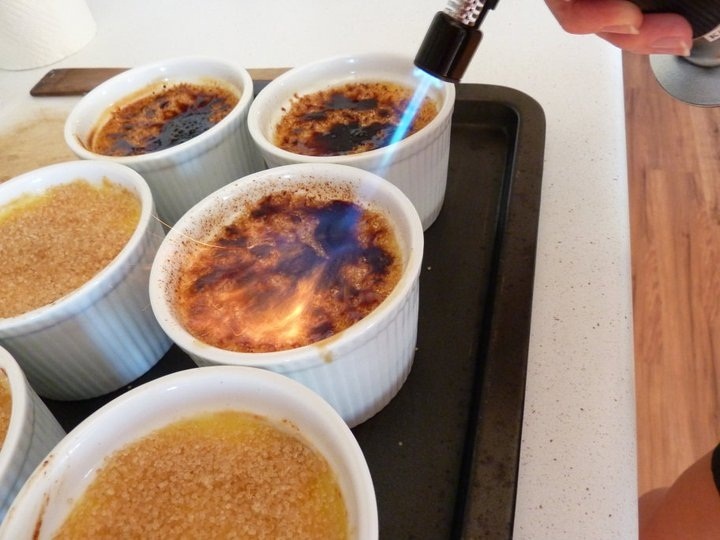 Once you’ve stirred for this long, get a nice deep baking dish and pour the mixture into your ramekins and put hot water up to about half way up the ramekins. 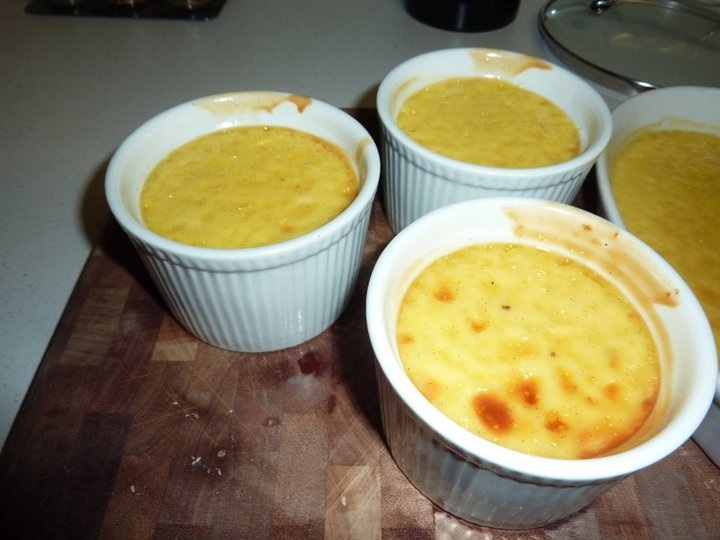 I found that with the ramekins I had that I actually had to make a double recipe to fill them up to near the top. So yes a stack of eggs and a massive amount of cream – but you can’t scrimp on dessert! So they go into the oven for 35-40 minutes. Given my concern that I wouldn’t get them right the first time I made these on the Friday night, ready for Saturday lunch, plus it meant they could stay in the fridge overnight and really set. So once we were ready to eat them though I opted to sprinkle on some demerara sugar, just so that there was a layer evening on top. 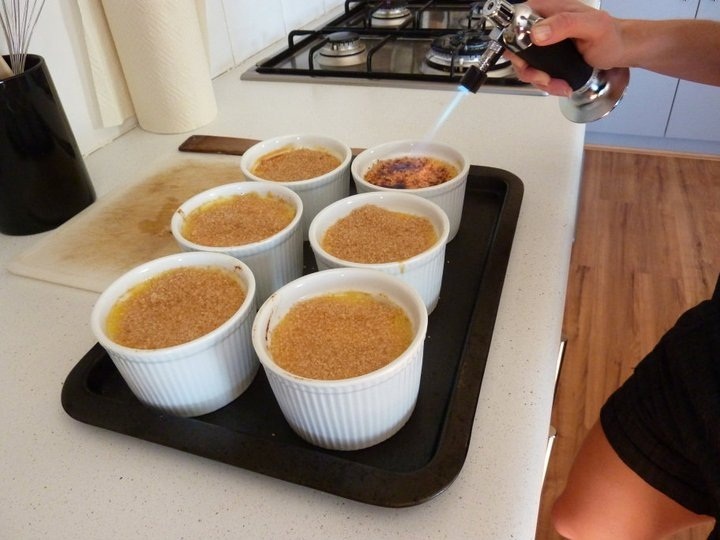 So then crank the torch and get the top sort of like molten sugar. Super fun to do! I probably used a little bit too much sugar on top on this occasion, but I was happy enough with how they worked out. The vanilla flavour was there, and they had that cracking sound when you hit the sugary top with a spoon, plus everyone seemed to like them so that’s the most important thing I think.